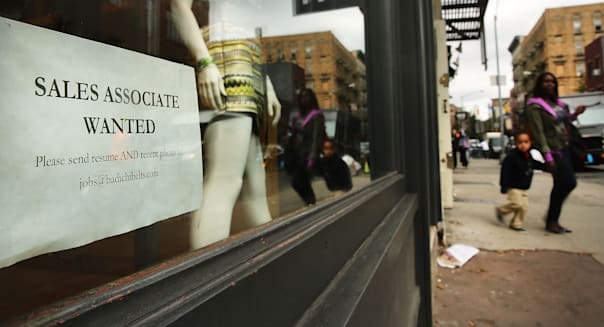 WASHINGTON -- The number of Americans filing new claims for unemployment benefits fell last week to nearly its lowest level since before the 2007-09 recession, a sign of growing steam in the U.S. labor market. Initial claims for state unemployment benefits dropped 1,000 to a seasonally adjusted 287,000 in the week ended Oct. 4, the Labor Department said Thursday. Economists had expected claims to rise. The data adds to the view that strength is building in the U.S. economy. "The labor market is entering into a potential boom," said Joseph LaVorgna, chief U.S economist at Deutsche Bank (DB) in New York. Still, Federal Reserve officials remain concerned about persistently low rates of inflation and aren't seen in a rush to hike interest rates with the economies of key trading partners flagging. A separate report showed U.S. wholesale inventories rose by the most in four months in August, a sign the economy may have grown more than expected in the third quarter. Many economists think the economy grew at an annual rate of around 3 percent in the July-September period, much faster than average rates over the last few years. U.S. stocks opened lower as investors took profits after a big rally Wednesday that had been fueled by minutes of the Fed's last policy meeting, which suggested an interest rate hike could be delayed because of growing concerns on the international outlook. The U.S. dollar, which had been on a long run up through last week, slid to a three-week low against the Japanese yen Thursday, while yields on U.S. government debt rose modestly. "The gradual improvement in continuing claims is particularly encouraging and is consistent with recent declines in the unemployment rate, suggesting that unemployed workers continue to find gainful employment," said Gennadiy Goldberg, U.S. strategist at TD Securities in New York.